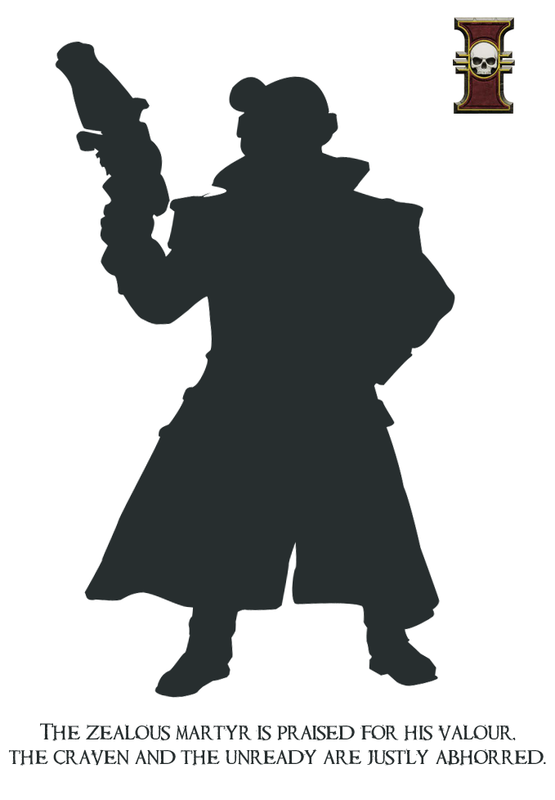 Today in the Forgeworld Christmas newsletter they revealed their teaser jigsaw image, which turned out to be a Fimir from a unit of such models set to feature in the forthcoming Warhammer Forge Monstrous Arcana book. Cool stuff! For those who don't remember the Fimir, or who are sitting with a blank expression reading this and wondering what the hell they are - the Fimir were a long defunct race from Warhammer, created by Jes Goodwin and Graeme Davis back in the late 80's. Inspired by the Fomorians of Celtic myth, they are hulking cyclopean humanoids with barbed tales and sharp beak like faces. If I remember right, they died out of inclusion in the Warhammer universe around 4th edition due to a lack of popularity. 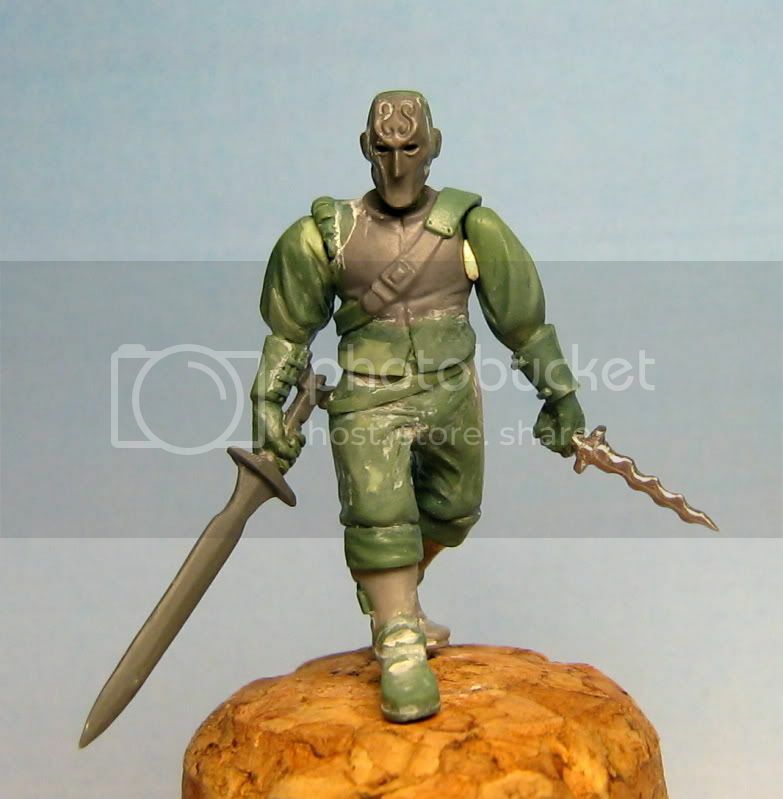 Ironically, the old figures (one pictured below - it's not mine, if you are the owner let me know and I'll reference as required) prove popular with collectors now and many still hold up well in terms of sculpting quality. I love what is coming out of Warhammer Forge at the moment and the fact they are bringing back many cult classics (including Chaos Dwarfs) with modern revisions to fit with the current background is pretty cool. In fact, I have it on trustworthy recommendation that Santa will be bringing me the wonderful Theodore Bruckner model for Christmas - I can't wait! Have a great Christmas folks and keep your eyes peeled for some posts with new painted stuff in the coming weeks! Well, given that it was Halloween this past Monday, aside from carving pumpkins (seen above, mine is on the right), I thought it would be fitting to take a look through some of my long dead projects and see if anything could inspire me back into working on them. Fitting the "resurrection of the dead" Halloween theme, I thought I would share some pictures of these withered "ghouls"! 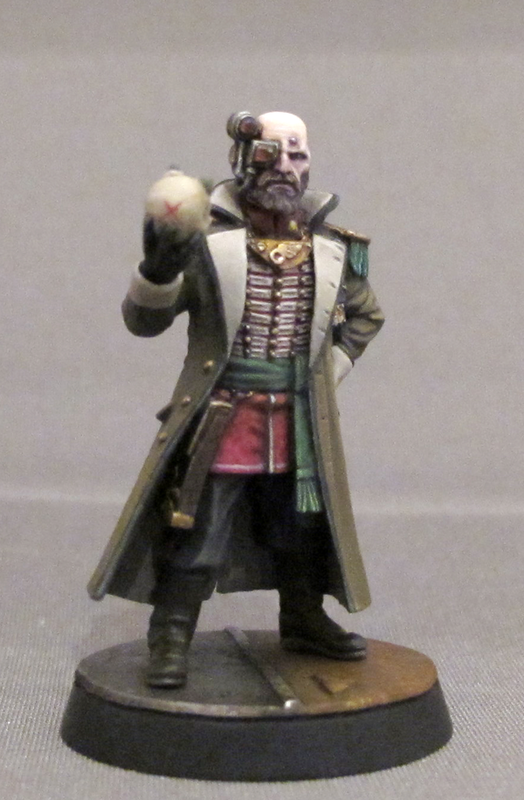 First up is the Kislev Boyar I had been working on in Summer 2010. An almost complete scratch sculpt, this was originally intended to be my main entry into the Warhammer Fantasy Single Miniature category at Golden Demon 2010. Sadly, as it came time to get painting I begun to notice a lot of nagging flaws in my sculpt work which put me off ever finishing him. At the moment, he resides on my shelf of unfinished projects in the state currently seen above - a few roughed in base coats and a wash on the skin. In the end I opted to paint up a slightly converted Averland Captain as my entry for Golden Demon 2010 instead. Next up, a "spooky" Genestealer Magus that I based on a Forgeworld Tau Air Caste figure and sculpted extensively over to get to the point you see him at now. As you can see, I started to paint parts of him, but as this was done in early 2010, just before I moved to a new flat, he got sidelined and was never returned to. Looking at him now, I have no doubt I could have sculpted and painted what has been done much better now. 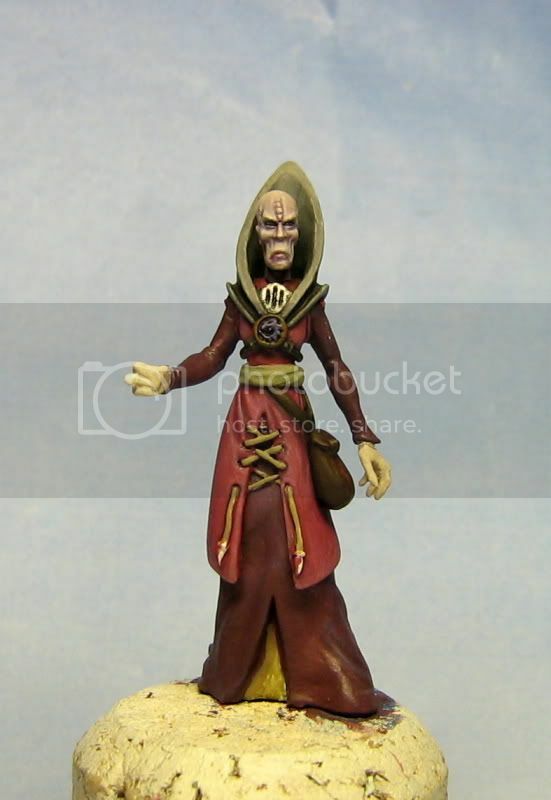 This figure was inspired by the Assassins Creed 2 computer game and my desire to create a more enigmatically posed version of Vespero - the old Dogs of War character. I actually still quite like how much of this scratch build has come out, I've just never been able to find the concentrated inspiration to go back to it! This one is really quite old now (2008?) and from back when I was just getting back into the hobby again after a few years away. The sculpt work on the head leaves a lot to be desired and, as you can probably see, is a little worse for ware now too. I'm still quite fond of how the paint job on the flesh was turning out on this one though. Oh well! I guess to sum this post up, I get a lot of ideas for projects. 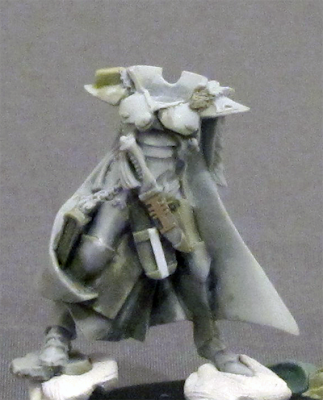 Typically quite elaborate and involving a reasonable amount of sculpting or conversion work. Usually being time poor for the hobby, it is quite common for a project to get to a particular stage before I begin to lose the inspiration and motivation required to complete it (much to the continued frustration of my beloved girlfriend!). For each unfinished piece here, there are at least 2-3 times as many on my shelf - sad but true! Anyway, I hope you have all enjoyed this little walk down an eerie memory lane! Feel free to share your thoughts in the comments. 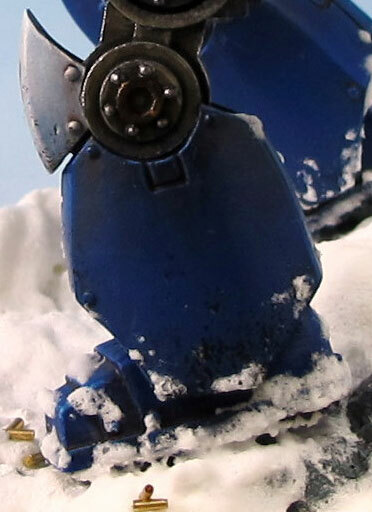 As I mentioned in my last post, I had used a number of products and techniques which were new to me on my Ultramarines Contemptor Dreadnought. Among these were the AK Interactive Streaking Grime and Rust Streak products. The main strength of these products is the ability to continue to tweak and alter the effect even after it has dried by going back in with a brush that has been moistened with white spirit. By doing this you can knock the effect back if you have done too much, or make streaks longer etc. If you are looking to pick some up, in the UK I would recommend Scale Model Shop. As I was running around in trying to get my entry finished in the run up to Games Day, I made a couple of orders for necessary items and they arrived within 2 days of ordering - top service! Back from a week off after Games Day and have finally got around to taking some decent pictures of my main entry for Golden Demon 2011 which took Bronze in the Warhammer 40k Vehicle Category. This is the first vehicle (let alone large model) I have painted in around 10+ years so it was a much bigger challenge than I had at first considered - particularly given that I had 2 weeks from clean up and assembly to finished and mounted on it's plinth (using rare earth magnets)! Next year I hope to do a few more entries well in advance so that I don't feel so rushed and under pressure. Having left it until the last minute, there are a few things I know I could do better/more on which may have helped improve the final placing, but I am definitely still very pleased to have taken Bronze for the second year running (and my second year entering) given the quality of competition. I tried a lot of new things on this model (a risky strategy on a competition entry when under time pressure) and was pretty pleased with the results. I don't have the time or energy for a full write up on them right now, but expect to see posts on using enamels, AK Interactive Streaking Grime, making icicles and making your own decals in the not too distant future. Just ordered one of the new Contemptor Patter Dreadnoughts from Forgeworld and I have to say, it looks like one awesome kit. 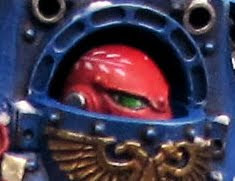 I haven't really been excited by Space Marines of late. The only SM kit in the last 4-5 years that I've purchased and put together being the FW Raven Guard Captain Korvydae that I bought at Games Day UK last year and finished back in February. However, this kit I most definitely am excited about. I think it's in part because it looks like a really big marine, part because it looks like a really big robot (I love Transformers btw) and part because it looks like a very flexible, pose-able kit with a great silhouette. At the moment the weapon options are limited to power fists (which look very nice) and a twin linked lascannon (cool, but I'm less sure about how it fits with the kit as a whole). I've opted for the dual power fists. Fortunately the weapon options won't be limited to just those mentioned above. Recent pictures from Games Day Chicago show some very nice looking additional weapons, including twin assault cannons, conversion beamer and cyclone missile launcher, and a slight variation on the body. In general, the quality of releases from Forgeworld lately have been excellent and I'm definitely looking forward to a lot of the upcoming releases. In the meantime, it's back to the work desk for me to get cracking on some Golden Demon entries! It was my birthday in June (the 10th for those looking to mark it in their calendar!) and one present from my lovely other half was the new FW Empire command group for the Manann's Blades swordsmen. They really are lovely figures and some of the best cast quality I have seen from Forgeworld - minimal clean up and crisp, clean detail. Excellent! A treat to myself for my birthday, I picked this one up from eBay for the cheapest I have seen him go. What I like about this figure is the fact that it maintains the key style elements of the original Chaos Dwarfs, combined with some more modern Chaos style ques. Unfortunately, as this guy is probably a bit too small and unimposing to make a good Golden Demon Fantasy Single entry, he's probably not too high on the priority list at the moment. That said, I am keen to get paint on him as he looks nice and "easy" to paint. PDH from Dakka Dakka's P&M forum has put together a little friendly invitation only contest ("Pimp My Wizard 40k!") 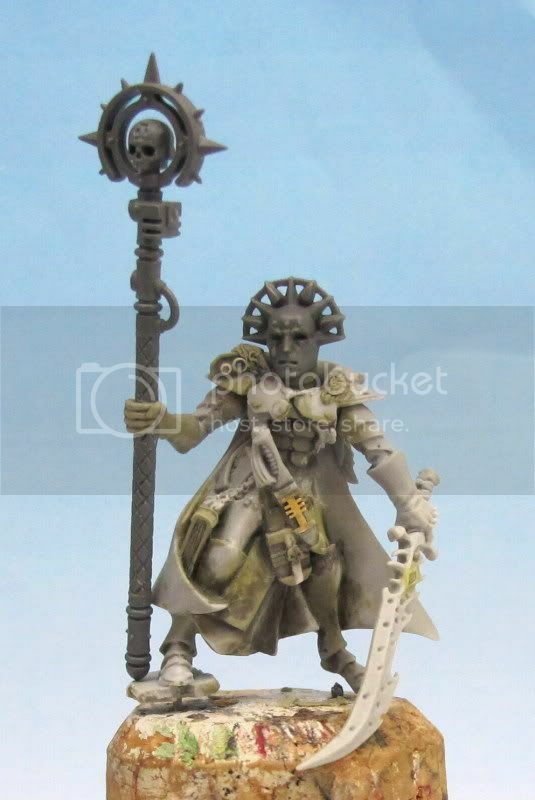 to convert one of the new Storm of Chaos plastic wizards into a 40k character and I was invited to take part. Again, another very nice looking kit with bags of conversion potential! 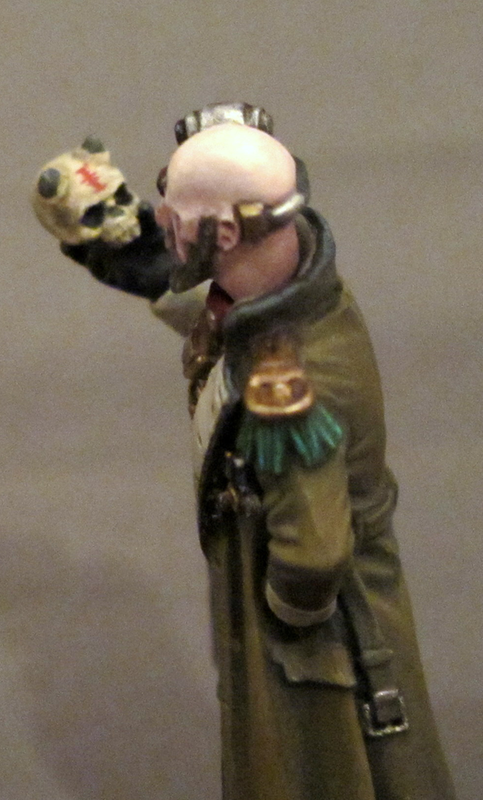 Finally, I will be continuing with my Inquisition Warband models I have been working on of late. I finished the sculpting and conversion work on the Inquisitor below the other day and have begun applying basecoats. Hopefully I will get at least the bulk of the paintjob done before the model above arrives! Well, I figured it was about time to reveal the figure from the teaser image I had posted previously. I managed to finish the paintjob on this guy last weekend but have only just got round to taking pics - as usual, they are far from perfect! 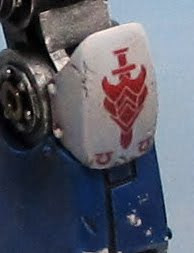 Regular readers may recognise the base model from an old conversion job of a Rogue Trader. 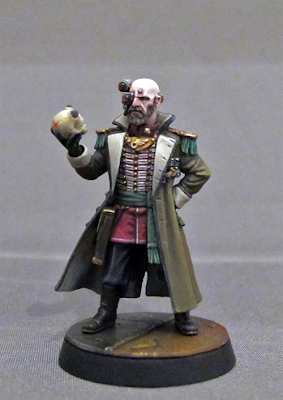 I was looking at the figure a while back and realised that I could do a much better job now - plus, a Rogue Trader would be a perfect addition to the Inquisitor warband I'm building! Finally, my finecast Dark Eldar Archon has undergone some serious conversion work already, and while far from finished, I figured I'd share a pic of my progress. This conversion work would have been almost impossible to reasonably achieve if the figure was metal since large areas were cut into and carved. Still lots more work to do, but you can expect to see this guy again soon! If you frequent any hobby forums (Warseer, Dakka Dakka etc), visit the GW website regularly/receive their newsletter/read White Dwarf, then you probably can't fail to have noticed all the talk about Games Workshop's new Citadel Finecast range. If you are wondering what Finecast is, then to summarise, Games Workshop have decided to move away from casting character figures, monsters and elite units in white metal, instead opting for a new resin hybrid - the Citadel Finecast range. In the first wave, there are around 120 Citadel Finecast kits, cast using the new resin. These include a range of the most popular figures previously cast in white metal for most armies, along with all the new character and elites/monster releases. The word is, all new models which would have previously been cast in metal will now be cast in the Finecast resin and the change will also sweep back through "most" of the existing miniatures still cast in metal. What I've heard is that, as a metal figures stock expires, the decision will be looked at whether to cast it in the new resin, or just continue to cast it in metal, though I suspect resin to be more likely. Anyway, with all the hype about today's big release of the Citadel Finecast range, I decided to pop down to Games Workshop Glasgow to have a look for myself and pick up a figure to experiment on. The fact that the new range is cast in resin excited me from the moment I first heard about it. As regular readers will probably already be aware, I hate working with metal miniatures. 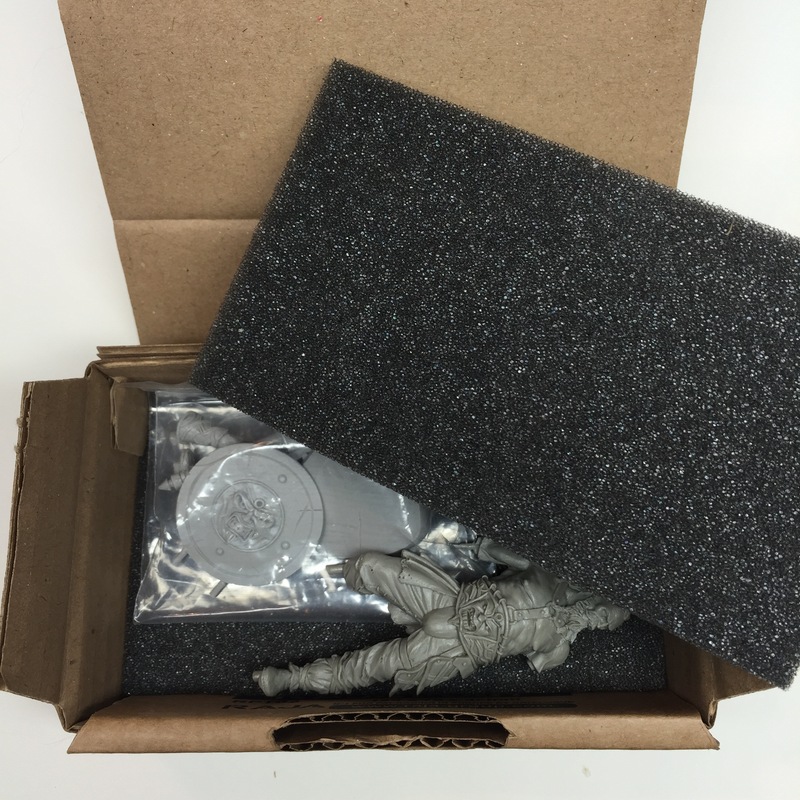 Resin offers excellent conversion potential to a range of miniatures I previously would never have considered due to being easy to cut, carve and clean compared to metal. While in store, I was given a look at a range of the new Citadel Finecast kits, large and small, and I have to say - I was very impressed with what I saw. The details were crisp and sharp, there was little flash and what there was is easily removed and the figures were very light and resilient (Steve the manager dropped a LOTR elf with bow from about 2 feet onto the table and it simply bounced - the bow, which was very thin, didn't even bend or break). Best of all, because the material is so light, large kits which were once a pain to assemble when cast in metal (such as the Nurgle Demon Prince and Shaggoth) are now extremely light and easy to put together. So much so that you could simply glue all the parts without pinning (though I probably still would just to be 100% cautious). 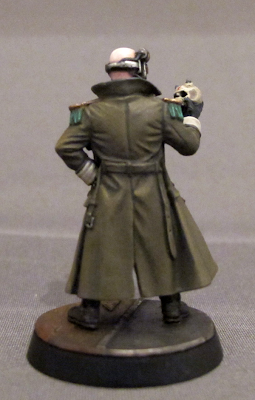 Anyway, as I mentioned, I decided to pick up one of the new Finecast figures to do some experimenting on. In the end I settled on the Dark Eldar Archon. 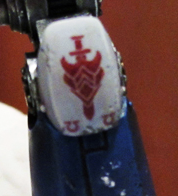 The first thing I will say is that I was impressed by the relative lack of flash on the sprues for the figure. 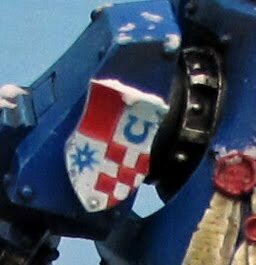 Earlier in the week there was some serious "scare mongering" going on following a blog post on an early opening of the Grey Knight character Draigo which seemed to have a lot of excess flash and generate a lot of negative comments. I looked at a couple of the Draigo blisters in store and a few did seem to have more flash than other kits, but I guess the advice is to look at what you are buying to make sure you get a good cast before you put your money down. I expect the casting quality to get much better now that the big push to get a worldwide release out has passed. As you can see from the pics, the amount of flash on this particular figure is insignificant - a couple of thin filmy bits but nothing a quick trim wouldn't easily remove and certainly much quicker to clean than metal flash. This figure comes on two small sprues, one for the body and right arm and one for the head options, shoulder spike and weapon arm. The detail on both sprues has come out perfectly - no evidence of tearing, warping or air bubbles/detail not filling. The mould lines are also very small which is always welcome. I had seen some people commenting on forums that the Finecast range requires more vents to be cut in the mould, meaning more contact points for flash which would obscure details. Honestly, on this model I don't see what all the panic was about. The flash is no more than was ever present on a metal model (excluding the spure of course) and the contact points between sprue and figure are very small and do not meet at any detail points. Like all models, whether metal, resin or plastic, I think I will still be sanding most surfaces to get as smooth a finish as possible, but for the casual painter and those who game, I really think the Finecast range will be welcomed as an improvement over metal miniatures. 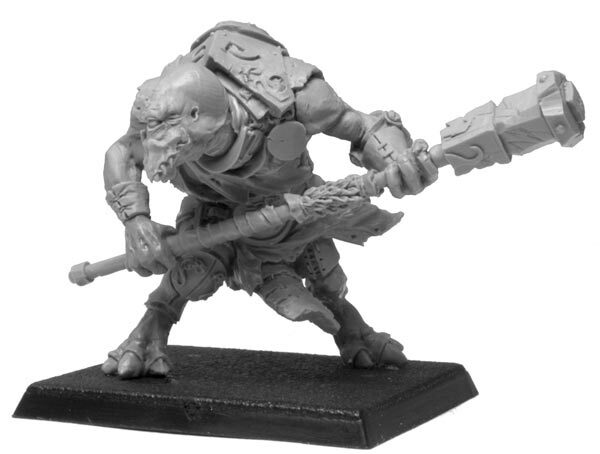 I know that personally, I am really looking forward to being able to use some new and existing sculpts for conversions and have already been eyeing up the current Citadel Finecast releases, identifying models with interesting "new" conversion potential! Feel free to leave your own thoughts in the comments. Bit of a teaser this blog post, but I've been working on something "new" (yes, I know...) that has been sparking my hobby muse. A bit of something different for this blog post. A common topic on many hobby forums and something I always find pretty interesting is that of hobby spaces and hobby rooms. The little (or sometimes large!) sanctuaries we all have where we work away at what we love. When I lived with my parents and family I never had a permanent hobby space that I could set up and leave projects for "hobby fermentation" (the creative kind, not the smelly, foosty kind!). I always looked on at threads where forumers posted their glorious hobby spaces with envy, aspiring to one day have my own full time space for modelling and painting. My desk, complete with paint ranks (could use a couple more to be fair! ), hobby mat, spray booth, manequins, lamps (with day light bulbs), a pretty view along the river and plenty of drawers and storage for bits and pieces! A rather empty miniatures cabinet - because everyone needs somewhere to keep their work and still be able to see it for inspiration and to measure progress agaisnt. The drawers beneath my desk, full of all manner of hobby tools and materials, along with the numerous boxes of models and parts that have started to accumulate here. Finally, the model cupboard (well, one side of! ), each white drawer is full of boxes or sprues of miniatures (because you can never have too many...!). Thanks to the Royal Wedding tomorrow, I'll have a rare opportunity to spend some extra time in here working on some of the recent projects I've shared so hopefully I'll have something to show from these over the weekend.